Netsuke are small carvings made in Japan for over 400 years. They where functional objects. The traditional Japanese clothes, the kimono, had no pockets. But it had a sash (obi) around the waist. Any items that people wanted to carry with them where suspended from the sash with cords. 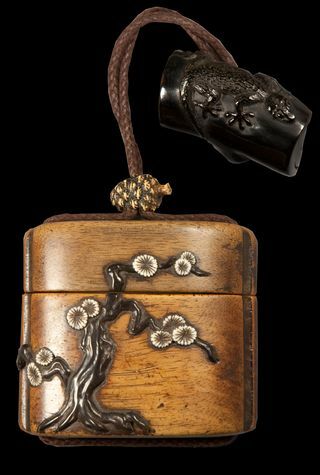 A netsuke was tied to the cord above the sash to prevent the cord from slipping through. Most netsuke have two holes for the cord, called himotoshi. The Japanese carried with them inro, tobacco pouches and pipes, tonkotsu and money pouches. Netsuke are made from various materials. Such as ivory, boxwood and other woods, whale tooth, stag antler, boar tooth, bone, lacquer and other materials. The subjects are also various; animals, people, gods, plants, daily life, myths, legends, zodiac, etc. The size and shape of netsuke vary just as much as the subjects. There are a lot of sites explaining the use of netsuke. See also my Links page.